Product prices and availability are accurate as of 2019-04-17 11:41:18 UTC and are subject to change. Any price and availability information displayed on http://www.amazon.com/ at the time of purchase will apply to the purchase of this product. Essential for larger kitchens, the Cavaliere SV218-ACS-CCEL-D-WM 10 ft. Chimney Extension lets you makes sure your brand new Cavaliere range hood is installed at an appropriate height for ceilings between 9' and 10' feet tall. In order to perform at its best, the vent intake needs to be positioned between 26 and 34 inches above the cooking surface. 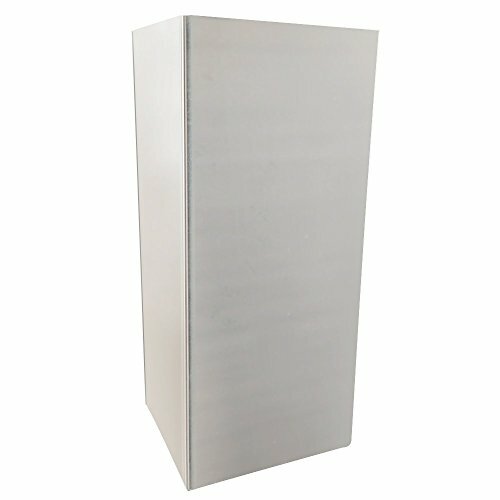 Intended for use with Cavaliere Wall Mounted range hoods (Models SV218D Wall Mounted Range Hood), this stainless steel unit features a chimney-style design to pair seamlessly with the decor. About Cavaliere: Cavaliere offers a complete stainless steel range hood collection. They blend superior components with the latest technologies to create range hoods that cater to your needs. Cavaliere has a special understanding of the kitchen environment, ergonomics, aesthetics, and integration within your home or workplace. They specialize in wall-mounted, island, or under cabinet range hoods that make a statement in your kitchen. Made from sturdy, solid stainless steel. Manufacturer's one-year warranty.